Pearl Jam spent most of yesterday teasing their fans by insisting they #StayTuned to their Twitter account. The big reveal? Eddie Vedder, Jeff Ament, Stone Gossard, Mike McCready, and Matt Cameron will hit the mound at Chicago’s Wrigley Field this summer on Friday, July 19th. 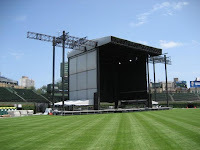 While rumors percolated over the weekend, the Seattle veterans confirmed the news today after a string of tweets, which included an older Chicago gig poster and a photo of an erected stage on the legendary baseball field. Though, they weren’t the only ones in on the fun. The Cubs’ official Twitter account tweeted a baseball jersey sleeve with the number ’10′ on it and Pearl Jam’s proposed hashtag of #StayTuned. Tickets will be available February 9th. In anticipation, check out the event’s Facebook page and relisten to Vedder’s anthem to the Cubbies with a stream of “All the Way” below. In related news, Vedder told Rolling Stone the band’s “maybe halfway there” in completing their follow up to 2009′s Backspacer. Although we originally pegged it as one of 2013′s most anticipated albums, the frontman insists “we’re taking our time,” so perhaps we’ll have to wait until 2014.